The 141st running of the $2 million Kentucky Derby (G1) Presented by Yum! Brands was contested on a perfect Saturday afternoon at historic Churchill Downs in Louisville, with sunny skies and temperatures in the mid 70's for the record 170,513 paying spectators in attendance. After El Kabeir, International Star, and Stanford scratched with second also-eligible Tale of Verve not drawing in, a field of 18 three-year-olds went to post beneath the Twin Spires for this 1 1/4 mile main track classic. Rebel (G2) and Arkansas Derby (G1) winner American Pharoah was sent off as the 3-1 favorite, off a 4 race winning streak. In to challenge him included 4-1 second choice Dortmund, undefeated in 6 starts including the San Felipe (G2) and the Santa Anita Derby (G1), and 8-1 third choice Carpe Diem, winner of the Tampa Bay Derby (G2) and the Blue Grass Stakes (G1). 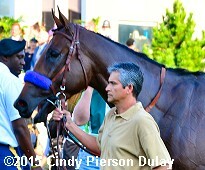 9-1 fourth choice Firing Line, winner of the Sunland Derby, was the only other horse in the field at single digit odds. American Pharoah leads on the outside down the stretch. When the gate opened at 6:43pm, jockey Martin Garcia sent Dortmund to the lead and he set fractions of 23.24, 47.34, 1:11.29, and 1:36.45 over the fast track while stalked by Firing Line and pressed by American Pharoah and 10-1 fifth choice Carpe Diem. 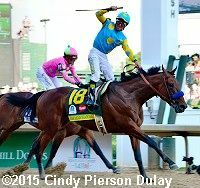 Dortmund continued to lead to the 3/16 pole but jockey Victor Espinoza angled American Pharoah to the center of the track for room. The favorite poked his head in front at the 1/8 pole and fought off Firing Line late to win by a length in 2:03.02. 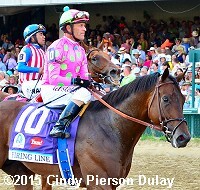 It was 2 lengths back to pacesetter Dortmund third, and a neck more to 10-1 fifth choice Frosted fifth. Carpe Diem faded late to finish 10th. Left: American Pharoah heads into the Kentucky Derby winner's circle. Winning jockey Victor Espinoza, celebrating his third Derby win, said, "The last few times that I rode him, it was wire to wire. It was so hard to me. One race I would like to follow somebody. Because I know I was already thinking about the Kentucky Derby. If I'm going to be in the lead, they're going to go after me. Always think hopefully, he can run, just track somebody. Arkansas was set up perfect for me. That was my chance. That was it. The other one went pretty fast in front. I was on the outside, and I could just take my chances. I know, Bob, he was probably angry with me. But, you know, I take a shot. And it worked out." Espinoza is only the sixth jockey to win consecutive Derbies (after California Chrome last year). 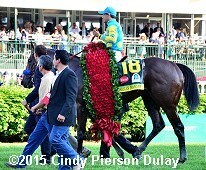 Right: American Pharoah parades with the garland of roses. 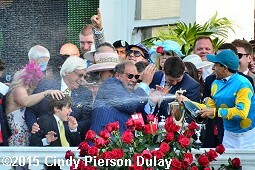 Winning trainer Bob Baffert, the third trainer to have 4 Derby wins, said, "Coming up here he got a little keyed up. The walk, the people got him really stirred up. He got a little hot. I had some anxious moments in the paddock. He got in there. He was starting to get pretty hot. He drug the groom all the way up there. I mean, he was really -- I didn't like what I saw. And so we finally got him in there (paddock). We got him wet down. Finally, he shut it down. After that, he was ready, he cooled off. I was just hoping -- when he turned for home, I was, like, just one of you (American Pharoah or Dortmund) get there, please." Left: American Pharoah and Victor Espinoza on the turf course approaching the winner's circle. Espinoza added, "I kind of rode him a little bit harder in the last 1/8 mile. The last 1/16 I know I got it done. It's all about confidence. You know, I went to this race with so much confidence with American Pharoah. The way he was running, the way he was winning. And especially for Baffert, the way he trained his horses are ready to go. Gave me a little bit more push to be a little bit more confident when he goes to this race, and especially in the Kentucky Derby." Right: American Pharoah heads back to the barn. 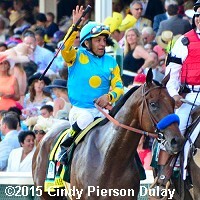 Baffert added, "If all goes well, I don't see any reason not to go (to the Preakness). So we're looking forward to it. The next one is -- I call it the fun one. You know, you're coming off a Derby high, going in there to Baltimore. And the Preakness is one of my favorite races. We're just going to enjoy it. We have two weeks to really watch the replay about a thousand times, enjoy it. And so I'm sure it's going to be tough. There will be some good horses in there. But I just love what I saw today from both of my boys. I'm looking forward to the next race." Left: The trophy presentation with jockey Victor Espinoza spraying trainer Bob Baffert and owner Ahmed Zayat with champagne. 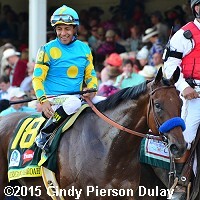 Zayat, celebrating his first Derby win said, "American Pharoah is very different from all the horses I had. Day one we felt that he had brilliance to him -- his demeanor, his aura, his conformation, the way he moved. I've always felt that, if this horse remains sound, he would win the Derby. I knew that, if he had the lead (in the stretch) nobody will catch him. He has such brilliant speed. I start getting really, really nervous. And my wife start crying. Like, literally, in seconds that emotion went from somebody who is crying out of fear that they're going to take it again from us to actually you have done it. Tear of joy. It was like a euphoria of emotions. I still cannot believe it. I don't even know who finished second or third." 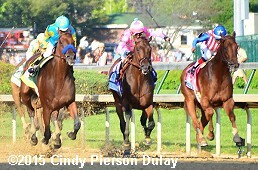 Right: Soon after the start of the 141st Kentucky Derby with eventual third place finisher Dortmund leading down on the rail, runner-up Firing Line pressing him just to his outside, and winner American Pharoah sitting third on the far outside. 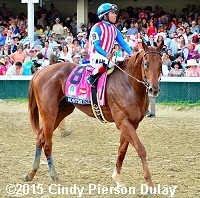 Right: Third place finisher Dortmund returns to be unsaddled after the race. Jockey Martin Garcia said, "He's a really good horse and he ran like it today. He always comes to run; that's the kind of horse he is. He got beat today by really good horses. 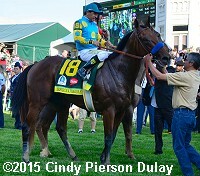 That can happen.� Trainer Bob Baffert added, "I just love what I saw. Because I knew I saw Martin was in a nice cruising speed. I'm proud of Dortmund. He ran a very game race."